Our editor, Erika Lenkert, crafted this recipe after enjoying something like it at a restaurant in San Francisco. 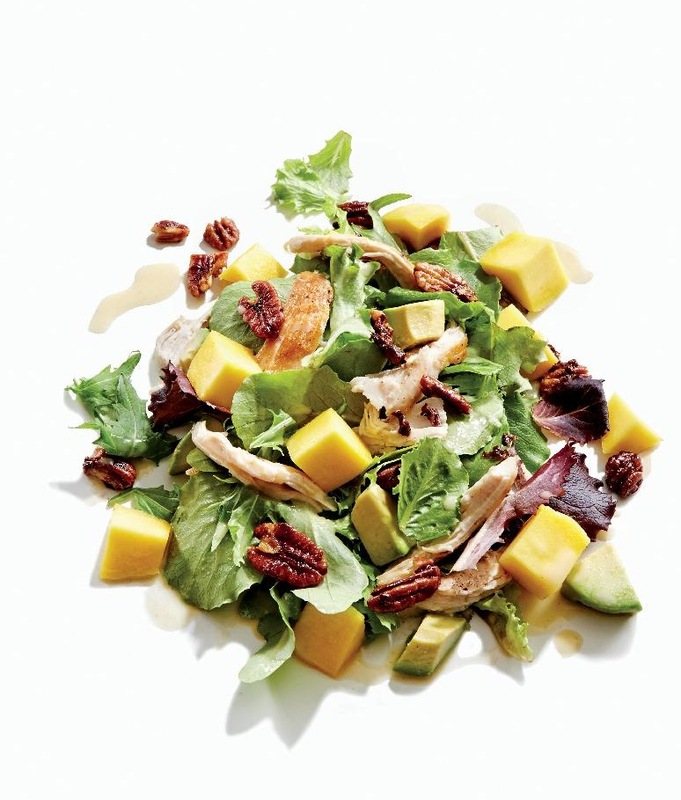 When salad is just the thing for dinner, you’ll find great satisfaction in its sweet, savory, and spicy flavors, which leverage deliciously fresh mango and avocado that we can get nearly all year round thanks to California growers. In a medium skillet, melt the butter over medium heat. Add the pecans, reduce the heat to medium-low, and cook, stirring frequently, until the nuts begin to turn a deep brown, around 5 minutes. Sprinkle the nuts with 1 tablespoon sugar and the cayenne and stir until sugar is completely dissolved. Immediately transfer nuts to a piece of parchment paper to cool. In a large bowl, whisk together the olive oil, vinegar, mustard, salt, and 1 teaspoon sugar. Add the greens, avocado, mango, and chicken and toss to coat. Transfer to 4 serving plates, top with the spiced nuts, and serve.